Live from Peoria Heights, Illinois, it’s Saturday Night Cheeseburger starring this week’s host, TNT’s and featuring The Ready For Prime Beef Player, Marty Wombacher. 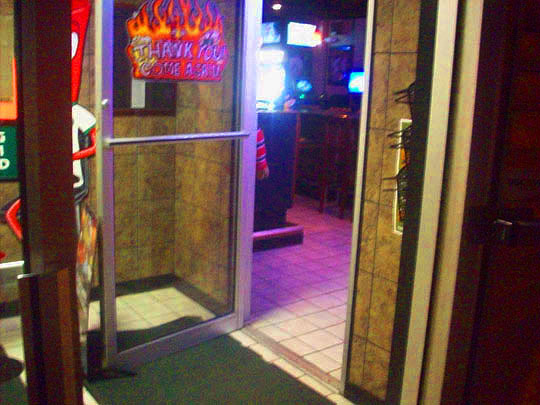 And now, please welcome this week’s host, all the way from Prospect Road in Peoria Heights, TNT’s Sports Bar & Grill! And we're off, in search of the somewhat elusive Saturday Night Cheeseburger. And here we are, TNT's on Prospect Road in Peoria Heights. The door's open, so let's go inside and see what's shaking. There's a decent crowd in here, but I see a spot there at the end of the bar. Head toward the light. And as soon as I sit down, Cat the friendly and pretty bartender on duty serves me up a pre-cheeseburger beer. The kitchen here closes at 10PM, so I phoned my order in from work and it's just about to be served up. They thought since I phoned it in, I was getting it to go, but I'm going to stick around and eat my cheeseburger at the bar. The cheeseburger is housed within this styrofoam container. Which always pleases me, as I've said before, nothing's better than enjoying a meal and destroying the environment all at the same time! I like the way its so uniformly packed in to the container. 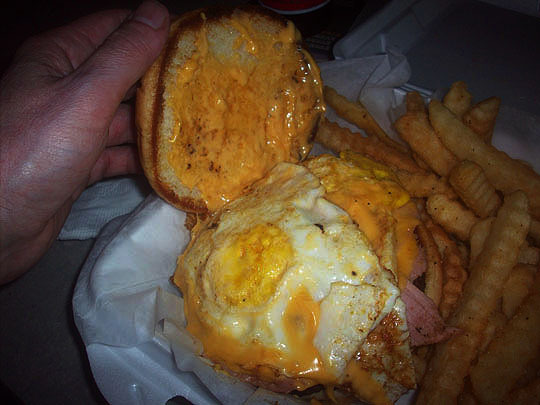 I got the All American Burger, which is a burger topped with melted American cheese, ham and a fried egg on top. It looks and smells amazing. Here's a pre-bite shot of the burger. Wow, this is one fabulous burger, you can read more about it in the review below. Now it's time to take a look around in here and walk off the meal. This is the view of Cat in action from my perch at the bar. Here's the taps, I like the way they have their own wall set up. I think this'll land them a decent rating from the Spike-O-Meter. The lit up bottles are standing at attention behind the bar. 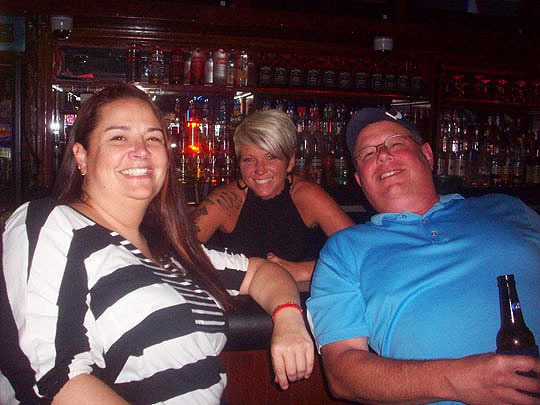 Here's Robyn, Cat and Barry chilling out at the bar. Barry's a regular reader of MBIP which is always cool to hear. Monica and Ryan were also at the bar and flashed award-winning smiles for the MBIP camera. 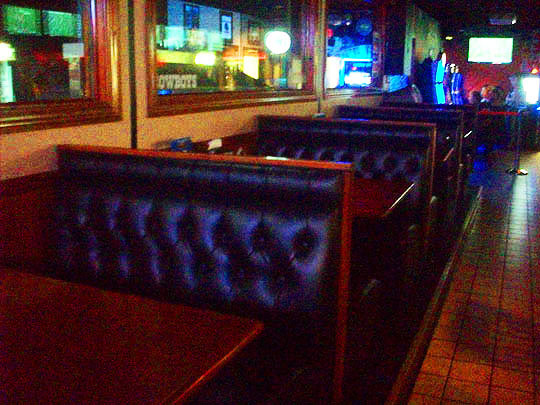 Booths line the walls on both sides of the bar for your dining and drinking pleasure. There's a long marble island in the center of the bar. Check out the couple playing darts, let's go and say hello to them. Hello, Ryan and Lauren, yikes, let's get out of the way before they throw those darts and put our eyeballs out! A shot from the back of the bar. Cat showed me this menu which is a list of all the different tenderloins they serve on Tuesday's. Look like we'll be coming back here soon! We'll see you all tomorrow. They have four different selections of burgers at TNT’s and I chose the All American Burger which is a half pound burger with melted American cheese, ham and a friend egg on top, served with special sauce on a bakery fresh bun. This was really a good burger with flavors from the egg, ham, cheese and the burger itself bursting though like a savory buffet in every bite. The other burgers on the menu are: Black ‘N’ Bleu burger, a Mushroom and Swiss burger and the NBA which is a half pound burger with American cheese, special sauce and a stack of onion rings. Other fare offered on the menu include thirteen styles of pizza, fried chicken, pasta and Tuesday’s are the tenderloin specials with a wide variety of tenderloins to choose from. I have to try this out for my twent tenderloins in twenty week’s marathon, so stay tuned for that! Three and a half Wimpy’s, a really tasty and delicious cheeseburger! Related posts: Satruday Night Cheeseburger @ Kuchie’s On The Water, New Amsterdam and Brasky’s Bar & Grill. Bonus Illustration From Jaws the Cabbie! 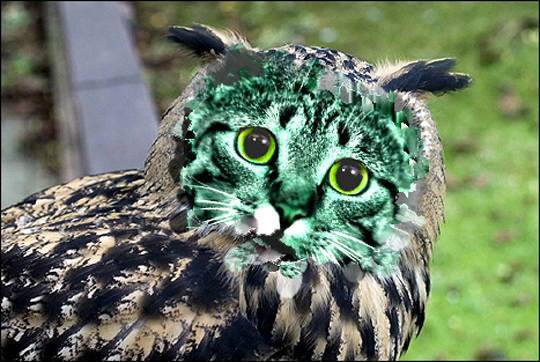 In honor of Cat the bartender, Jaws sent in this illlustration he calls, "Meeowl." Thanks, Jaws!